The temples in Khajuraho are divided into three geographical groups mainly, Western Group, Eastern Group and Southern Group. The Western group is the best known group of temples. 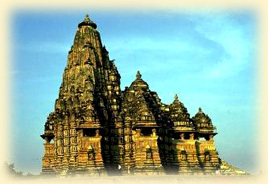 The Kandariya Mahadeo temple which is the largest and most typical Khajuraho temple belongs to this group. This temple is about 31 metres high. The main temple is in an almost perfect state of preservation. The temple has an exquisitely carved entrance arch. On the entrance the images of celestial bodies, lovers, musicians are beautifully carved. Beyond the archway of the Kandariya Mahadeo are the portico, main hall, transept, vestibule, sanctum and ambulatory. Another temple is the Chaunsath Yogini Temple. 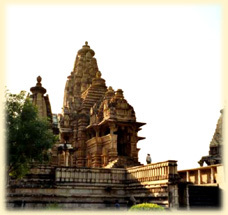 This temple is one of the three granite temples in Khajuraho. This temple is dedicated to the goddess Kali and is quadrangular in shape. But now out of 65 cells only 35 cells remain and the image of goddess Kali also does not survives. This temple is one of the earliest shrines, dating back to 900 A.D. The Devi Jagdambe Temple is another Kali temple, which was originally dedicated to God Vishnu. North of the Devi Jagdambe temple and facing eastwards to the rising sun, is the Chitragupta Temple. This temple is dedicated to Surya, the Sun God. The image of the god is about 5 feet high, and it drives a seven-horsed chariot. The group scenes depicted on the walls of the temple are equally spectacular with royal processions, elephant fights, hunting scenes and group dances. The Vishwanath temple's architecture is same like the architecture of the Kandariya Mahadeo Temple. The steps leading to the temple on the northern side are flanked by lions and on the southern side by elephants. Inside the temple there is an impressive three-headed image of God Brahma. The exteriors of the temple are very beautifully carved. Some of the Chandela rulers were devotees of Vishnu and so they built some of the Vaishnavite temples. One of the finest temple is the Lakshmana Temple. The lintel over the entrance shows the trinity of Brahma, Vishnu and Shiva, with Lakshmi, Vishnu's consort. The sanctum is richly carved and has a three-headed idol of Vishnu's incarnations, Narasimha and Varaha. The Varaha Temple is another Vaishnavite shrine. In this temple there is an idol of Varaha, the incarnation of Lord Vishnu which is about 9 feet high. Its surface is covered with figures from the Hindu pantheon. Matangeswara Temple is another temple dedicated to Lord Shiva, and has an 8 feet high lingam.